Rocky Mountain Elk hunts are for rifle or archery hunters. We have several high-quality Montana ranches that are professionally managed for trophy elk. The Flying D is our premier elk ranch which boasts a herd of 1500 elk. The average bull elk taken on the Flying D Ranch is 9 years old and will gross score 340 or more Boone & Crockett points. 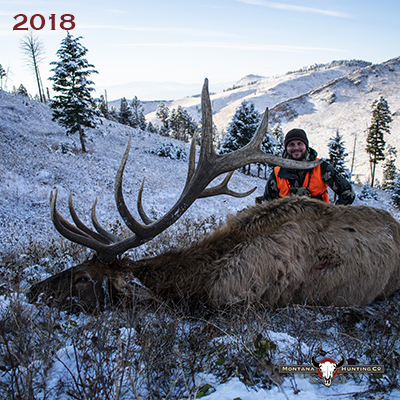 Elk hunter success annually is 90 - 95%. Our other ranches are managed for trophies with hunter success being equally as high. The Flying D Ranch is our premier elk hunting destination and is owned by Turner Enterprises Incorporated. The ranch contains 113,600 deeded acres located in the foothills of the Spanish Peak Mountains about 25 miles southwest of Bozeman, Montana. Elevations on the ranch range from 5,000 to 7,000 feet. Our southern boundary joins the Gallatin National Forest and the Lee Metcalf Wilderness area. This is great game country! The herd of 1,500 head of elk has a ratio of 65 bulls per 100 cows, with a large number of trophy bulls available. In 2017, our 30th annual Flying D Ranch hunt produced some outstanding trophies. The average bull during rifle season scored just over 350" B&C. The Bar None Ranch is another premier elk hunting destination in Montana. This Turner Enterprises Incorporated property contains 23,000 deeded acres. The Bar None Ranch extends into Broadwater and Gallatin counties and is geographically located in the foothill region at the southern end of the Belt Mountains. Bozeman's Yellowstone International airport is 1.5 hours from ranch headquarters. Topography is varied from arid foothill regions to rock cliffs on the south facing slopes of Sixteen Mile Creek. Generally, the property gains in elevation toward the east with Six Mile Mountain being the high point at 7,655 feet. This is a very rugged piece of property. The herd varies from 400-1,000 head of elk and has a ratio of 50 bulls per 100 cows with a large number of trophy bulls available. The Bar None Ranch has been professionally managed since 1987 for trophy animals. This 8,000 acre ranch is in Gallatin County, Montana, just 30 minutes north of Bozeman. The ranch terrain is mostly high foothill regions with Douglas fir trees, big sage brush and grasslands. Water sources are from springs and dirt stock tanks. It is prime elk and mule deer habitat. Most hunters kill 5-6 point bull elk and 3-4 point mule deer bucks. Some of the larger animals will score 300-350 gross B&C. Hunter success is high. This 18,000 acre Ranch lies along the west bank of the Blackfoot River near the town of Helmville, Montana. The nearest city is Missoula which is about 1 hour to the north. This is a working ranch that specializes in the raising of Red Angus cattle. The habitat is typified by lush river bottoms, low land pastures with willows, foothills covered with big sagebrush and mountains covered in a variety of pine trees. This large elk herd varies from 400-800 head. Hunters can expect to see lots of elk. Lodging and meals are included. Accommodations are a very comfortanle 6 bedroom, 4 bath lodge.